The Portokatsiki Blu-Holiday House is a self-catering accommodation located very close to the world known beaches of Porto Katsiki and Egremni, on the Greek island of Lefkada. It offers breathtaking view over the Ionian Sea and all comfort to its guests. Newly built and fully furnished holiday house on the south mountainous island of Lefkada (Ionian Islands), very close to the world famous beaches of “Porto Katsiki” (at 3 km) “Egremni” (at 6 km) and Vassiliki (at 10 km). It is an ideal house for up to 12 people and for those seeking relaxation and isolation among pines and captivating sea views. The nearest village is Athanion (at 9 km). 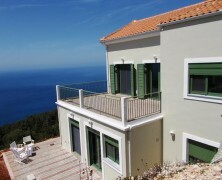 The residence is 45 km away from the capital town of Lefkada (about 50 minutes drive by car). The island of Lefkada has road access as it is connected to mainland Greece by a floating bridge of 50 meters length.